Discussing the implications of climate change on businesses. Private sector entities play a key role in helping realize the potential for sustainable economic growth and resilience when they are in line with national sustainable development and climate resilient objectives. To rigorously enhance successful engagement with the private sector in the Medium-term Action Plan IV (2018–2022), the International Centre for Integrated Mountain Development (ICIMOD) has developed the ICIMOD Private Sector Engagement (PSE) Strategy which demonstrates its commitment to strengthen collaboration with private sector entities in all of its regional member countries. The PSE Strategy provides a roadmap to amplify engagement with the private sector wherein the private sector is an important partner that offers unique skills, knowledge, expertise and resources in order to achieve mutual objectives and contribute to the sustainable mountain development agenda. 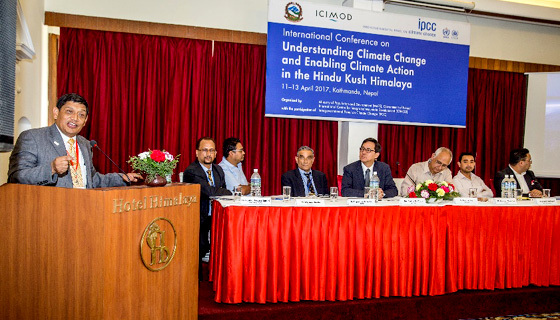 In April 2017, the Ministry of Population and Environment (MoPE), the Government of Nepal, and ICIMOD, with the participation of the Intergovernmental Panel on Climate Change (IPCC), organized an international conference on “Understanding Climate Change and Enabling Climate Action in the Hindu Kush Himalaya” in Kathmandu, Nepal. A session was dedicated to Climate Change Implications to Businesses: Moving Together for Climate Action. ICIMOD considers the private sector a key development partner, and the session discussed various means for building innovative partnerships to combat climate change. ICIMOD’s private sector partners, MinErgy Pvt Ltd, SunFarmers Nepal and Dabur Nepal Pvt Ltd, shared their experiences working in project activities related to climate change mitigation. A panel discussion was held with potential private sector partners to exchange ideas on how to develop multi-stakeholder partnerships for Climate Action in the HKH. The panel discussion brought together dignitaries from UN Global Compact Member; Coca-Cola, India and South Asia; Bhutan Chambers of Commerce and Industries, Bhutan; Chaudhary Foundation, Nepal; Creative Pathways, Bangladesh; Dolma Impact Fund, Nepal; and ICIMOD. To address the interest and need for accessing finance for ongoing ICIMOD initiatives in Nepal, an interaction session with Shikhar Insurance Co Ltd and NMB Bank Limited was held at the ICIMOD headquarters in Kathmandu. The session explored potential for collaboration in mutual areas of interest. Udit Kafle, Assistant General Manager, Shikhar Insurance Co Ltd, presented on the Agriculture and Micro Insurance, and Weather Indexed Insurance schemes in Nepal. Kafle indicated that the information generated by ICIMOD could be of significant help to insurance firms in Nepal. Dinesh Dulal, Head–Renewable Energy and Micro Finance, NMB Bank Limited, highlighted the micro-finance schemes currently accessible from rural mountain areas in Nepal. These, he said, could be of interest to ICIMOD’s ongoing efforts in Nepal. Key interest was shown in the area of access to finance for the beneficiaries of ongoing ICIMOD activities and mutual areas of collaboration were explored. As part of the NMB Bank Limited hosted the 9th Global Alliance for Banking on Value meeting in Nepal in March 2017, a group of 20 investors from various parts of the world visited the ICIMOD Knowledge Park in Godavari for a learning tour. Over the past few years, NMB Bank Limited has been focusing on self-reliance and has been investing in various projects aimed at supporting local communities. The tour of the ICIMOD Knowledge Park was an opportunity for awareness building for the corporate sector and an important outreach activity for ICIMOD to engage the private sector. ICIMOD’s one of the most successful partnerships with the private sector have been with MinErgy Pvt Ltd and Sunfarmers Nepal. MinErgy Pvt Ltd is a service oriented company dedicated to working on energy efficiency, environment and renewable energy technologies at the household and industrials level to achieve improved energy, environment and health conditions. Sunfarmers Nepal is an innovative energy solution provider for agriculture, health, education, and businesses. As prominent private sector partnerships on reducing climate change impacts, the two organizations were invited to showcase the successful partnership to an event in Istanbul, Turkey, for the private sector session discussion at the Regional Dialogue on Nationally Determined Contributions for Eurasia organized by the United Nations Development Programme (UNDP), the United Nations Framework Convention on Climate Change (UNFCCC) Secretariat, and the UNDP/United Nations Environment Programme (UNEP) Global Support Programme for National Communications and Biennial Update Reports. The event was funded by the Global Environment Facility (GEF), and held in February 2017. The partners talked about their ongoing partnership with ICIMOD and discussed project activities related to climate change mitigation. Suyesh Prajapati, Programme Director, MinErgy Pvt Ltd, presented on the brick kiln initiative that was initiated after the 2015 Nepal earthquake. He showed the link between climate and sustainable development goals (SDGs), which is especially strong for small and medium-sized enterprises (SME) as well as in the contexts of disaster response or resilience. Similarly, Avishek Malla, SunFarmers Nepal’s Director of Engineering and Operations, gave a presentation on solar energy for irrigation. He said that making solar energy accessible through a renting mechanism or a financing solution in partnership with farmer cooperatives is a key factor for success. Both the presentations were appreciated by the participants from Jordan, Afghanistan, Germany, Bangladesh, Bhutan, and other countries. The UNFCCC Manager showed a keen interest on the model presented by SunFarmers Nepal.